Registering more than one kid? You get the Multi-Kid Discount! Opens for Registration on February 15th! 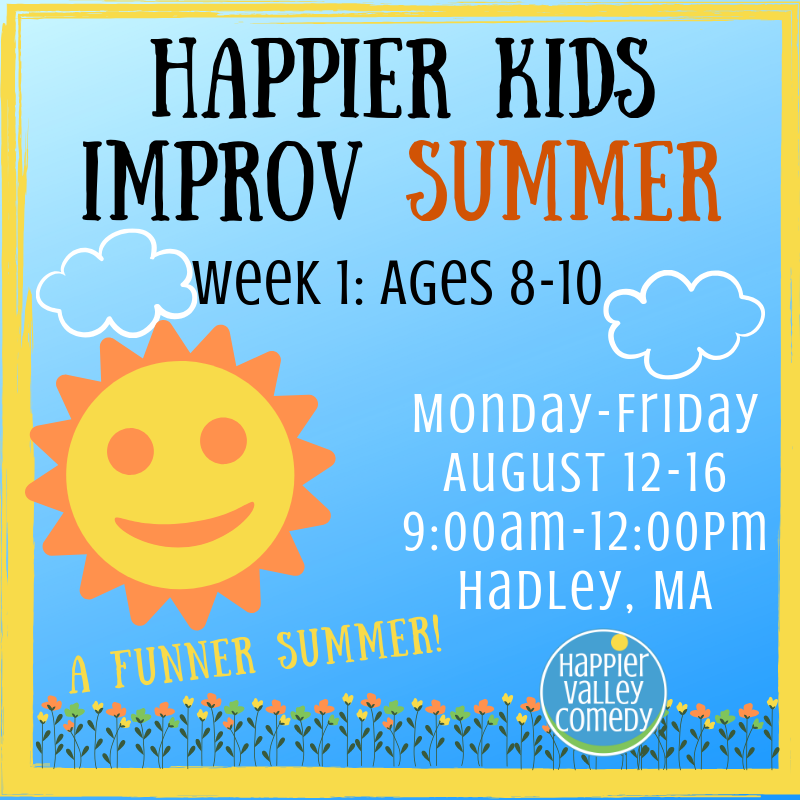 Let's make your summer FUNNER at our week-long Happier Kids Improv Classes! For kids’ eyes only: Join long-time improviser Kelsey Flynn and trusty assistant Jenna Funicella for five half-days of improv comedy fun. Each day, we’ll focus on a different improv comedy structure such as guessing games like “Late for Work” and character games like “Emotional Rollercoaster” and many, many more! We’ll learn how to play the games and then have lots of time for everyone to get a chance to try it and feel good about trying. And before we get started, we’ll warm-up with zany circle games that will help us connect as friends and be ready to support and laugh with one another. Whether you’re brand new to improv or have played a bunch already, you are guaranteed to have fun because that’s what improv is all about. For adults’ eyes only: In recent years, research studies have shown that laughter is known to reduce stress hormones, boost brain power, increase energy and focus, in addition to being contagious. Using fun and low-risk comedy improv games such as “Late for Work” and “Emotional Rollercoaster” (all suitable for elementary-school aged kids), we’ll laugh as well as strengthen self-expression and communication skills. Jenna Funicella teaches high school mathematics and works as a behavior therapist for children with special needs. Jenna has been taking both improv and standup classes along with various workshops at Happier Valley Comedy for the past year and has fallen in love with the art. Her goal is to share the joy of improv with the world (especially kids!) Jenna will be traveling to Chicago this summer for a five-week improv intensive at the iO Theatre to further her studies. unless we have 48 hours notice before the event AND we can get someone to fill that spot. *If you have a kid who would love this and is a little too young/old, email us here, so we can put you on our mailing list to find out about upcoming programs in our ever expanding offerings! *Our classes involve physical activity and we could be on our feet for at least an hour.